It was that way yesterday when Dodger lefthander Rich Hill took the mound in Pittsburgh against the Pirates and threw a perfect game into the ninth inning – broken up only by an error – and a no-hitter into the tenth, only to lose 1-0. In so doing, he became the first pitcher since Lefty Leifeld of the 1906 Pirates to lose a game while pitching at least nine innings and allowing one or fewer hits and no walks. I’d never heard of Leifeld until today, but he was a good pitcher on the powerful Honus Wagner-led Pirate teams of that time, winning 21 games in 1907 and finishing his career at 123-96, with an ERA of 2.47. If he’s lucky, on any given day a pitcher can control what he throws, but he can’t control how his teammates fare at bat against the opposing pitcher, which was the rub for Hill yesterday. Despite managing seven hits and four walks against Pirates’ starter Trevor Williams in eight innings, the Dodger hitters – a wrecking crew for months now – couldn’t produce a single run in support of Hill. They went 0-9 with runners on base and stranded 11, picking exactly the wrong time to go cold for a day. The Dodgers more or less started their regular lineup, with one notable, and, as it turned out, telling exception: they gave third baseman Justin Turner the day off. Turner, whose unruly orange locks and beard make him look like a cross between Erik the Red and Yukon Cornelius, has been among the hottest hitters in baseball for weeks and he also sports a good glove at third. Hindsight is always 20/20, but if Turner had been hitting in his customary third spot in the order he may have driven in a run or two, but we’ll never know. We’ll also never know whether Turner’s glove would have made a difference on the play resulting in the ninth-inning error that ruined the perfect game; in this case the baseball gods gaveth and tooketh away. Turner’s replacement at third, Logan Forsythe – normally a second baseman – made the error, but Logan’s replacement at second base, the veteran Chase Utley, made an astonishing play to preserve the perfect game in the eighth inning, stretching out and leaping to just snare a bullet line-drive in shallow right field. We’ll never know if Forsythe would have made that play, but Hill’s near-perfection was also aided by a great defensive play in the fourth inning. Josh Harrison attempted a bunt to break up the perfect-game bid, sending a weak, quickly-dying pop-up toward first base. Adrian Gonzalez, just off the DL with a herniated disk, made a great sliding grab of the bleeder just before it could land on the grass. If it had fallen in, it might have been one of the cheapest hits ever to break up a perfect game. And for good measure, Hill’s cause was also aided by the relatively new video replay review. In the second inning, Jay Bell sent a hard grounder to Gonzalez and the umpires called him safe when Hill’s tag at first base seemed late. But the Dodgers called for a review and the umpires reversed the call, paving the way for all the drama to come. So, apart from the lack of run support, Hill’s near-perfect game had plenty of help, but this is often so in such cases. None of this takes anything away from his pitching, which was dominant and ultra-efficient: he struck out 10 and threw just 99 pitches in the entire game. Morrison’s error came on a hot bounder off the bat of Jordy Mercer which was both a tough chance and a tough call. It was a kind of in-between hop that ate him up and it’s doubtful many third basemen would have made the play. Under the circumstances it had to be scored an error rather than a hit, not very fair on Morrison. The perfect game was gone, but Hill still had the no-hitter going and more importantly, the Dodgers had to prevent a run here. Catcher Chris Stewart sacrificed Mercer to second, but Hill retired the next two batters in order. Hill entered the bottom of the tenth with the game tied 0-0 and his no-hitter intact. The first batter he faced, Josh Harrison, sent a pitch on a low line to deep left field which just cleared the fence. At first it looked like Curtis Granderson had leaped and caught it, but no, it was gone. For fans of geometry and the new metrics, it’s reported the ball had an exit velocity of just 94 m.p.h. and a launch angle of only 33%, meaning that it would be a home run less than 10% of the time in any park. In more old-school terms it was a cheapie home run, but it counted all the same. For Rich Hill, it was bye-bye no-hitter, bye-bye baseball game and hello loss. Damn. To add insult to injury, Pittsburgh reliever Juan Nicasio was credited with the “win” for facing three Dodger batters in the top of the 10th. Curses, foiled again. But if you think Rich Hill was hard done by……..veteran fans watching this game must have thought of Harvey Haddix, renowned for giving the greatest losing pitching performance of all time on May 26, 1959. Haddix, nicknamed “The Kitten” because he was small and had a sly, feline face, was a lefty finesse pitcher who’d had considerable success with the Cardinals, winning 21 games in 1953 and 18 in ’54. But he dipped after that and was traded to the Phillies in 1956, then to the Reds in 1958 and at 33, to the Pirates in 1959. Given his small size and aging journeyman status, he could never have been expected to achieve what he did that night in Milwaukee. Against the slugging Braves in their hitter-friendly home park, Haddix threw a perfect game – no hits, no walks, no base-runners allowed by error – for an unheard-of 12 innings. Normally, perfect games end after nine innings, but Haddix faced much the same problem that Rich Hill did yesterday: zero run support. His counterpart Lew Burdette, no slouch on the mound himself, scattered 12 hits and gave up no walks in shutting out the Pirates for 13 innings. Haddix took the mound in the bottom of the 13th with the score tied 0-0 and someone had to blink first. Third baseman Don Hoak, more known for his fist-fighting than his fielding, booted a grounder by Felix Mantilla, allowing him to reach first base – so much for the perfect game. Unbelievably, the gigantic slugger Eddie Mathews was asked to bunt Mantilla over to second and succeeded, something you’d rarely see in a game today. With the perfect game now gone and a runner in scoring position, Haddix made the wise decision to intentionally walk Henry Aaron. There was only one problem with this – Aaron was followed by another hulking bomber in Joe Adcock, who promptly bashed a pitch over the fence in deep right-centre for what should have been a game-winning three-run homer. But Aaron somehow thought the ball had glanced off the wall and cut across the diamond, thinking Mantilla would score the winning run, which he did. But Adcock passed Aaron on the basepath and they were each called out, so the game ended 1-0, Braves. The photo below tells the story – Haddix standing on the mound in a slightly slumped posture which registers disbelief and shock, exhaustion and stoical resignation all at once, as Mantilla heads home with the winning run. No doubt in shock, Haddix took the insupportable loss in stride and with decent humour, but was said to have walked the deserted streets of Milwaukee alone for hours after the game. 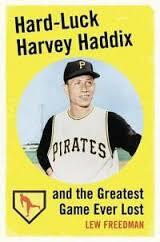 Forever after, Haddix was known as “Hard-Luck Harvey”. He died in 1994, but his special place in baseball lore is forever secure. Vin Scully is much missed and it would have been wonderful to hear him call Hill’s near-masterpiece yesterday. Scully would no doubt have woven the Haddix game, and perhaps some of Koufax’s gems, into the overall baseball narrative, which by some miracle would have ended just as the actual game did. Haddix’s only competition for the best pitching performance in a losing cause came from Warren Spahn, who once threw 15 scoreless innings, only to lose 1-0 on a Willie Mays home run in the 16th. 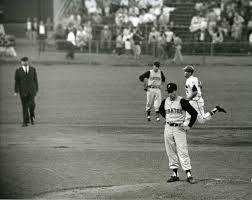 It happened in a game between Spahn’s Braves and the San Francisco Giants in Candlestick Park on July 2, 1963. As is often the case in these pitcher’s duels, as great as Spahn was, the other guy pitched even better. The other guy was Juan Marichal, who, believe it or not, threw 227 pitches in 16 shutout innings. Marichal was 25 at the time and Spahn, who threw 207, was 42. No, I’m not making this up, and if you don’t believe it you can read about in a wonderful book by Jim Kaplan, fittingly titled THE GREATEST GAME EVER PITCHED. Or failing that, you could look it up on-line, as Casey Stengel would say if he were alive today. Returning to Rich Hill, he was gracious after the loss, crediting the Pirates and their starting pitcher Trevor Williams, who stands to be the forgotten man in this whole exercise. He also thanked his teammates for their great fielding and exonerated Forsythe for his tough-hop error. His philosophical attitude was no doubt made easier by the fact that this loss, tough though it was, was a mere blip on the screen in the Dodgers’ historically great run so far this season. They currently have a winning percentage of .712, have won 89 games already and are on pace to win 114, which would be among the top five seasons ever. Seemingly, all that remains is to see whether they parlay this dominance into October glory and a World Series win, as did the 1998 Yankees, who also won 114 games. The ’98 Yankees are far and away the greatest team I’ve seen since I began watching the game 45 years ago. They had everything except a weakness. But just as easily it could be an October tank-job for the Dodgers, not only because of their recent history of this, but because it has befallen other teams having great seasons. Such as the 1906 Cubs, who set an all-time record with 116 wins, then lost the Series in four straight to the crosstown White Sox, who were dubbed “the hitless wonders” – I guess they must have had some pitching. Or the 1954 Indians, who set an American League record that year with 111 wins, only to be swept in the Series by the New York Giants on the heroic pinch-hitting of Dusty Rhodes and “The Catch” by Willie Mays in the cavernous Polo Grounds centerfield. Or the 2001 Seattle Mariners, who tied the Cubs with 116 wins, but didn’t even make it to the Series that year. Yes, it could go either way for the Dodgers this coming October, for, as we’ve seen in the case of Rich Hill and these other pitchers, baseball is an unpredictable, hard, and heartless game, which is why it’s so compelling. Hippo Vaughn give up a couple of walks, but talk about a hard luck no-hitter. Wow I just found your blog because I was looking up on Google to see if there was any info on the internet about Gary Mapp (as I wanted to find out if indeed bassist Gary Mazzaroppi and he were the same person (they aren’t!). And now I find an article about my favorite baseball game of the year on your blog! Amazing! I am a Dodger’s fan originally from LA but living in France for 30 years now. I spent the summer in LA with my elderly parents (and attending 3 Dodger games with my father) before heading home to Paris on August 23,2017. During my 5 hour layover in London (ahh the joys of cheap air tickets…) I watched this amazing game on my laptop (via mlb.com)and I’ll never forget it. It’s funny how seemingly this game triggered off the Dodger’s cold spell when they lost 16 of 17 games before finally going to the World Series. My only regret was not having been able to hear Vin Scully (who of course retired just last year) announce this game as he was always fascinated with the Harvey Haddix game, often mentioning it in his broadcasts. Did I mention that I’m also a long time fan of the Rob McConnell band ? My semi-pro Big band in France played his arrangement of “Strollin'” and each time we played the tune it was an absolute harmonic delight (we changed the “triad joke” on the CØDA though !). I also remember playing his “Just Friends’ arrangement back in the 1980s. Back again. It was Josh Bell the First baseman for Pittsburgh. Jay Bell was indeed a player for Pittsburgh but back in the 1990s.